Paucity of polymorphic molecular markers in chickpea (Cicer arietinum L.) has been a major limitation in the improvement of this important legume. Hence, in an attempt to develop sequence-tagged microsatellite sites (STMS) markers from chickpea, a microsatellite enriched library from the C. arietinum cv. Pusa362 nuclear genome was constructed for the identification of (CA/GT) n and (CT/GA) n microsatellite motifs. A total of 92 new microsatellites were identified, of which 74 functional STMS primer pairs were developed. These markers were validated using 9 chickpea and one C. reticulatum accession. 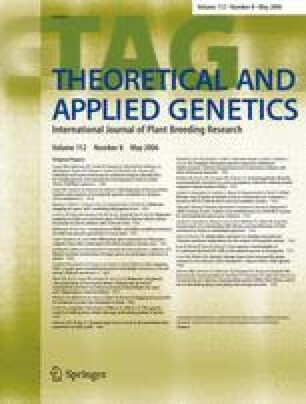 Of the STMS markers developed, 25 polymorphic markers were used to analyze the intraspecific genetic diversity within 36 geographically diverse chickpea accessions. The 25 primer pairs amplified single loci producing a minimum of 2 and maximum of 11 alleles. A total of 159 alleles were detected with an average of 6.4 alleles per locus. The observed and expected heterozygosity values averaged 0.32 (0.08–0.91) and 0.74 (0.23–0.89) respectively. The UPGMA based dendrogram was able to distinguish all the accessions except two accessions from Afghanistan establishing that microsatellites could successfully detect intraspecific genetic diversity in chickpea. Further, cloning and sequencing of size variant alleles at two microsatellite loci revealed that the variable numbers of AG repeats in different alleles were the major source of polymorphism. Point mutations were found to occur both within and immediately upstream of the long tracts of perfect repeats, thereby bringing about a conversion of perfect motifs into imperfect or compound motifs. Such events possibly occurred in order to limit the expansion of microsatellites and also lead to the birth of new microsatellites. The microsatellite markers developed in this study will be useful for genetic diversity analysis, linkage map construction as well as for depicting intraspecific microsatellite evolution. Financial assistance for this work was provided by Department of Biotechnology, Government of India (BT/PR3518/AGR/02/179/2002) and National Centre for Plant Genome Research. The seed materials provided by ICRISAT, and IARI, India are duly acknowledged. The authors acknowledge the support and encouragement provided by Prof. P.K.Gupta, C.C.S University, Meerut, India, for initiating this work. NK and BS are recipients of Senior Research Fellow (SRF) scholarships from Council for Scientific and Industrial Research (CSIR), Govt. of India.